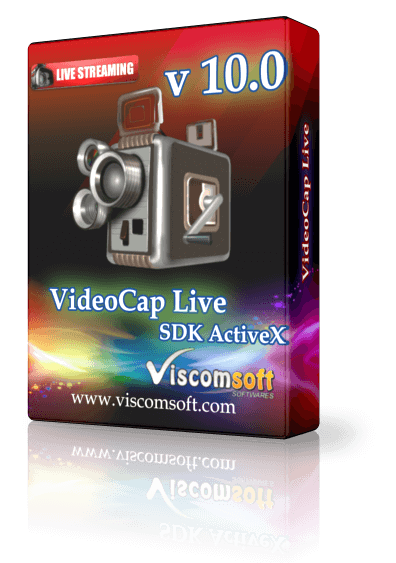 For Windows Developers who need to video capture to AVI, WMV, FLV, iPod, PSP, MPEG1, MPEG2 video format in c , c#, vb.net , vb, delphi, vfp, access. Capture Video from capture card, tv tuner, dv cam, dvd player to MPEG1, MPEG2, iPod, PSP, FLV, AVI or WMV 9, WMV8 file format. Support apply Distoring Mirror, Twins, Mosaic special effect to entire screen or selected video portions. (need purchased our Video Fx Plugin). Draw overlay bitmap on a video stream or save to video file. User define transparent color, alpha value. Include c# 2005, c# 2010, Access, Delphi, VB, VB.Net 2003, Vb.Net 2010, VC , VFP Sample Code. added Face Detection Fx plugin. It allow custom threshold for face detection and capture the detected face to JPEG file. (need purchased our Face Detection Fx Plugin). fixed access IP camera issue. added Sample Grabber to PictureBox, Bitmap handle features. added allow set the capture area and video format when using Virtual Screen Capture. You may dynamic change the virtual screen capture area. EffectFaceTrackBoxStyle, EffectFaceShowBackProjection, EffectFaceTemplateFile, EffectFaceThreshold methods. added Picture in Picture effect support 4 cams in same time. updated vb6, vb.net 2010 , c#2010 Sample Grabber samples. You may use sample grabber in .net now. fixed VideoFx preview issue when using on capture card. added UseMP4EncoderPlugin, Mp4AudioSamplerate, Mp4Audiobitrate, Mp4H264Profile, Mp4VideoBitMode, Mp4Videobitrate properties. fixed cannot use Zoom, Focus, Pan, Exposure, Tilt, Roll, Iris camera control features. added allow set Auto property of all camera control features . e,g, Zoom, Focus, Pan, Exposure, Tilt, Roll, Iris, BacklightCompensation, Brightness, Contrast, Saturation. fixed Auto property return not correct value of all camera control features . e,g, Zoom, Focus, Pan, Exposure, Tilt, Roll, Iris, BacklightCompensation, Brightness, Contrast, Saturation. Visual Studio \'s design time environment now. added Hue and Lightness effects. 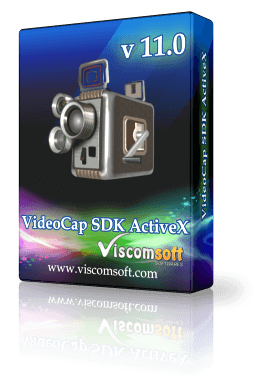 GetVideoCompressorName, GetVideoFormatCount, GetVideoFormatName, GetVideoInputCount, GetVideoInputName, GetWMVProfileCount, GetWMVProfileName methods. added EffectFxType, EffectMotionSensitivity,EffectPainterDrawingColor, EffectPainterDrawingType, EffectPainterPenSize, EffectType, EffectVideoFrame properties. added ChangeHue, ChangeLightness, EffectMotionSetDetectedRect, EffectPainterClear,EffectPainterZoom methods. fixed installer issue. fixed some dll files missing. added allow select show video window on top or not. added reset the default volume of audio input pin after end of capturing. improved center the video if rotate 90 or 270 degree. added dual display feature, the video will display full screen on monitor 2.
added allow hide or show full screen on monitor 2.
added allow return RGB Buffer if set SampleBufferMode property to 3. Now you may read the RGB value of each pixel easily. fixed IP cam issue for StartDot NetCam SC IP camera. added allow set the flv frame rate when output flv video. redesigned access IP camera engine, it support almost all IP camera that support MJPEG stream. support password protected IP camera. 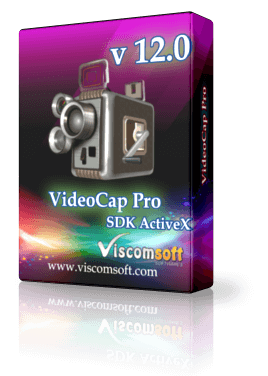 support capture the video to AVI, MP4, FLV, MPEG1, MPEG2 file from IP camera. support snapshot the video from IP camera. removed EnableIPCamera, IPCameraFile, IPCameraFileSeqNo CaptureIPCameraFile properties. improved the sync issue when output avi, wmv, ipod, psp, flv, mpeg file. added select different sync mode. improved show full screen mode and allow using keyboard key or mouse button to close the full screen. 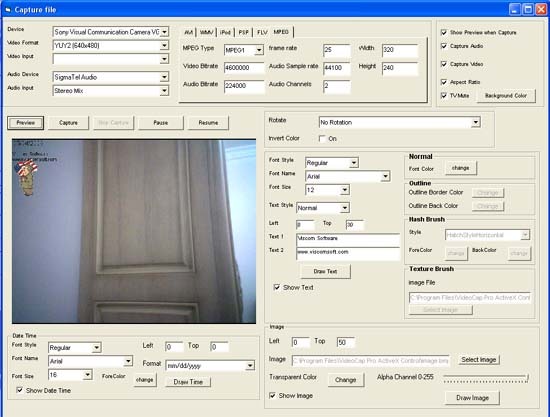 updated ShowVideoCapturePropertyPage, ShowVideoFormatPropertyPage, ShowAudioCapturePropertyPage, ShowCrossbarPropertyPage methods. it can set the window handle of parent window. added allow drawimage from HBITMAP handle. added UseOverlay, ClearFullScreenKey, ClearFullScreenMouseButton, ClearFullScreenType, CustomVideoColorFormat, CustomVideoHeight, CustomVideoWidth, ReceivedFullScreenHWnd properties. added CustomVideoFormatError, FullScreenKeyDown, FullScreenKeyup events. added output MPEG1, MPEG2 video.